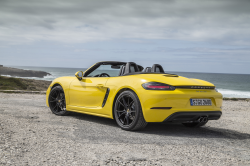 A frontal crash test uncovered a dangerous design flaw in the 2017-2019 718 Boxster and 718 Cayman. Porsche engineers say a crossmember from the luggage compartment bracket could detach, penetrate the bulkhead wall, and start a fuel leak. Fuel leaks bring fires. Fires bring sadness. Don’t be sad. If your car was built before 02/15/2019, Porsche will reinforce the crossmemebers as part of a recall.